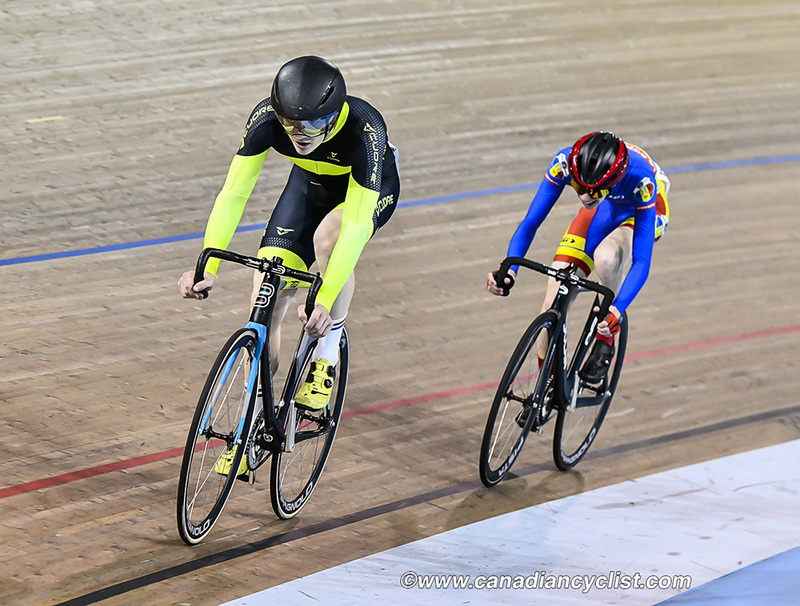 The Mattamy Cycling Centre hosted a weekend of record-breaking performances for the 2019 Canadian Under-17/Junior/Para Track Cycling Championships on April 12-14, in Milton, Ontario. A record 111 athletes from five provinces took part in the Championships, where five Canadian records were broken in individual and team events. The racing was fast and aggressive across all categories, with large fields in both the Under-17 and Junior men and women. While some riders dominated their categories, none had an easy time of winning, with strong battles in every race. All five provinces in attendance were represented on the podium, with four winning national titles. Nine athletes won multiple titles, led by two Under-17 riders, each with seven titles in the ten events contested. 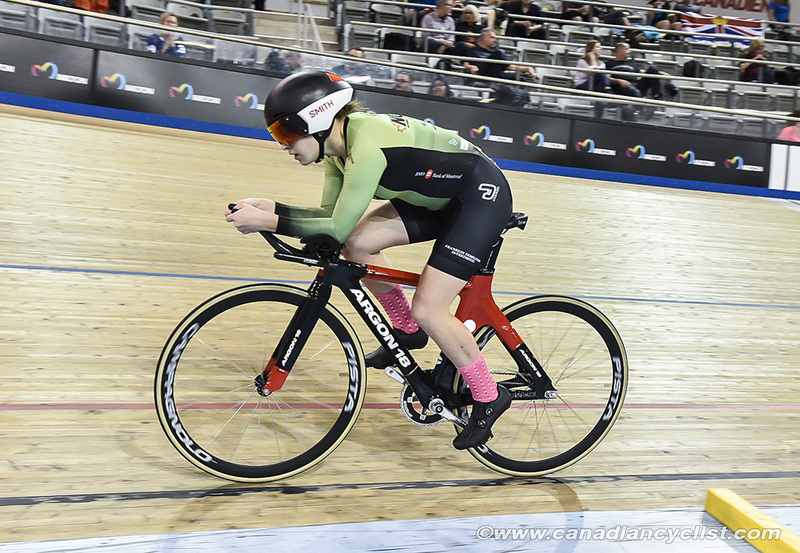 Nicole Bradbury (NCCH Elite p/b MGCC) dominated the U17 women's category with seven gold medals, a silver, a bronze and a Canadian record in the Individual Pursuit. For the U17 men, Dylan Bibic (Ascent Cycling p/b MGCC) also won seven gold, plus two silver and bronze, as well as setting a Canadian record in the 200 metre time trial. Other performances worthy of note were the four gold medals each for Junior riders Madison Dempster (Team Ontario) in the women's field and Riley Pickrell (Cycling BC) in the men's. First year Junior woman Ngaire Barraclough (Team Alberta) won three titles, while Equipe du Quebec riders Coralie Levesque (U17 women) and Tristan Jussaume (Junior men) each won two, as did Ontario's Junior men Andrew Scott (Midweek Cycling) and James Hedgcock (Madonna Wheelers). "It was a lot of hard work and conserving of energy in the early races," said Bibic. "Just pacing myself and taking it easy when I could, but it got harder and harder through the weekend." Bradbury had won the first round of the Mountain Bike Canada Cup a couple of weeks earlier, so admitted she lacked some confidence going into the Track Nationals. "Coming back from mountain biking, I hadn't been on the track in a couple of weeks, so I wasn't quite sure. My goal was to do well in the IP [Individual Pursuit] and break the record, and I had mostly been training for the endurance races. But I like racing everything, so I could change it up through the weekend." In the Para categories, national titles were awarded in the Individual Pursuit and 500/1000 metre time trials. Marie-Claude Molnar (Equipe du Quebec) took both titles in the women's C4 category, with Megan Miller and her pilot Candice Moote (School for the Blind) winning the women's tandem events, and Matthieu Croteau Daigle and his pilot Benoit Lussier (Équipe du Québec) winning the men's tandem events.